Cloutier really is a one-man orchestra. On a recent trip to the "Contented Cow" in Northfield, I thought, "They've got a group playing here tonight." As I wormed my way toward the front, I didn't see a group at all. What I heard were the sounds of a couple of guitars, bass and some sort of flute. Seated on a stool, sat a curly haired guy with a guitar. One guy. But the sounds were full and lush. It certainly wasn't karaoke because he was doing all the music himself, at the same time. No CDs in the background, no tapes. He uses some electronic toys called "looping devices," which immediately play back, or at the push of a button, whatever he plays. He can add layer upon layer of instruments by way of a guitar synthesizer. Way cool. People strained to see what he was doing. But it was difficult to see the action because the electronics are a couple of pedal boards on the floor. His music has the power to mesmerize, as his hands fly over the fingerboard, and produce different but incredible sounds. Steve worked through some of his own beautiful compositions, then through some jazz standards and a few tunes that are not easily nitched into a category. He then sang a couple more of his own bluesy pieces. Steve's been playing gigs since his high school days in the late 60s. After more than three decades of playing, he's got the guitar pretty well figured out. 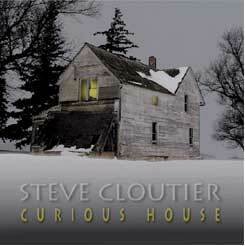 His newest CD release, titled "Curious House," contains 16 of his own songs. The song "Japanese Garden" from his current CD sounds like what you might picture a Japanese garden to sound like if could be turned into music. It's performed with the looping device, so that the song progresses with more and more sounds and nuances. It's sort of like butterflies stirring in the breeze. You really can hear more when you close your eyes. Your eyes tell you he can't possibly be doing all of this. Your ears tell you that he is indeed creating all of these sounds. He has his own CD label, "Raspberry Hill," and a couple other previous releases "Tin Cup" and "Poems of the Hobo Road." The guitars he plays onstage are his own creations. He's not currently building guitars at, but may resume in the future. I looked over three of his guitars. They were of the highest quality, beautiful sounding, rare tonewoods and easy to play. His guitars range in colors from sunburst yellow and brown, to red and almost orange, cedar and spruce tops with various colors in the stain. His jazz model is a beautiful red sunburst, and is a little smaller than the normal 16- or 17-inch body width. Steve has made more than 50 guitars. All but one are flattop acoustics. One guitar has a synthesizer built into it so it's capable of sounding like an Indian flute, cello or any instrument played or not yet invented. Another is an archtop, "F" hole, jazz model. His guitars standout from others partly because their fingerboards are more like classical guitars-flat, not curved. The interior bracing is lighter, which allows for the use of lighter, easier-to-play strings. They're not made for the heavy-handed player. The light bracing also allows for greater sustain and makes it easier to coax subtle sounds from them. Some professional musicians I know use Steve's guitars, including Pete Bloedel of Mankato, Bill McGrath of "Bonnie and the Clydes," Russell Letson (a writer for Fingerstyle Guitar) and Brian Bowen (a member of the Grassroots Concerts.) They all say they are the best guitars they have ever owned or played. It was a relaxing, fun night, listening to the magic of Steve Cloutier. 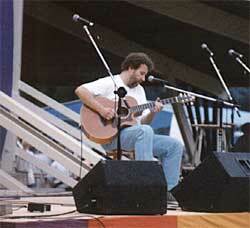 Steve plays in southern Minnesota cities as well as the Twin Cities. 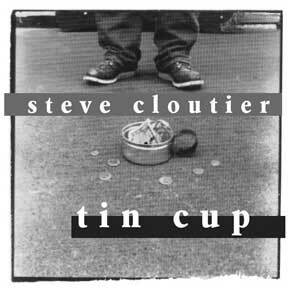 If you'd like to find out more about this amazing musician, check out his web site at www.cloutier.org. 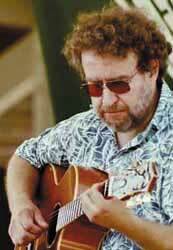 Gary Heil is a musician living in Northfield.